Brenda Barnard was born in Woodhouse Eaves, Leicestershire, in 1938 and moved to Rothley in 2006. 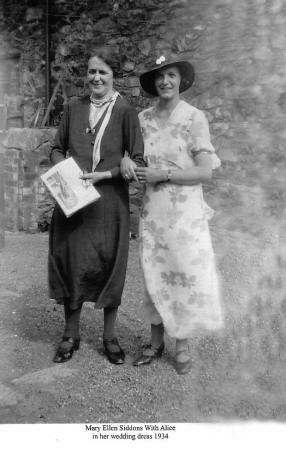 The grand-daughter of a seamstress, like many girls of her generation, Brenda was taught to sew and knit by her mother. Her school years, including eight years at Thomas Rawlins Grammar School for Girls, Quorn, developed her artistic skills and in 1956 she went to Loughborough College of Art and Design. Leaving in 1958 with a first class Diploma she went on to study at the Royal College of Art in London at a time when the textile courses were thought of, and run as, training for a place in leading British industry. The mid 1960s brought a range of design assistant jobs working on special events at leading hotels and night clubs. Brenda returned to Leicestershire in the late 1960s, working in the display department at Lewis's Ltd. before studying for a degree in psychology at the University of Leicester. 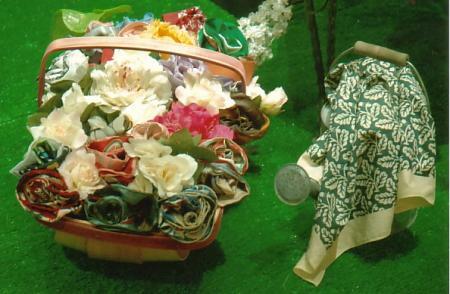 By now she was regularly visiting jumble sales and charity shops and developing her growing collection of headsquares and handkerchiefs; each an example of a different design applied to a small piece of fabric. 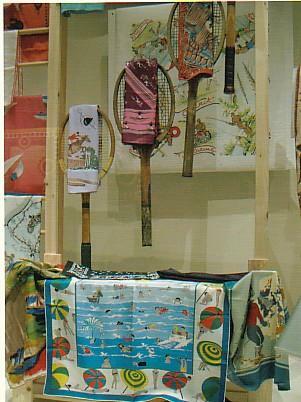 In 1960 three of Brenda's designs were exhibited at The Cotton Board in Manchester and in 1967 the leading manufacturer Jacqmar bought a design for a headsquare shown below. Brenda worked part-time as a designer and colourist in a design studio and was an assistant in an artists' material suppliers. Both experiences allowed her to find out about materials, techniques and skills used in design and the visual arts. 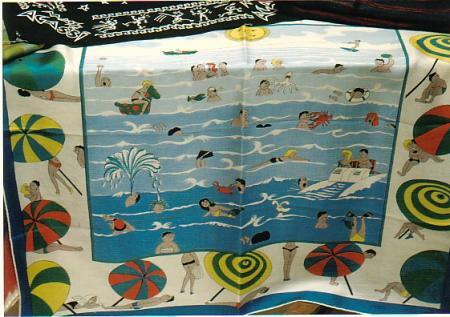 The design above is known as THE MISSING SCARF so please scroll down to see how you can help to trace this. Brenda decided to return to the world of design in the mid 1980s and studied printed textiles at Loughborough College of Art and Design. 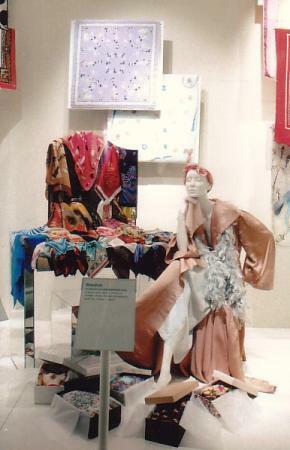 As her collection of scarves grew, and inspired by a visit to Liberty's 'The Scarf Show' in 1987, she put forward her collection for inclusion in 'The People's Show' and was asked to exhibit it at the New Walk Museum in 1994. In 2002 Brenda approached the Leicestershire Museums Service to ask if they would become the new home for the collection, which was formally transferred to its care in 2003. Brenda continues to work with the collection, using her knowledge to make careful catalogue entries, and her passion for good design to enthuse everyone she meets. 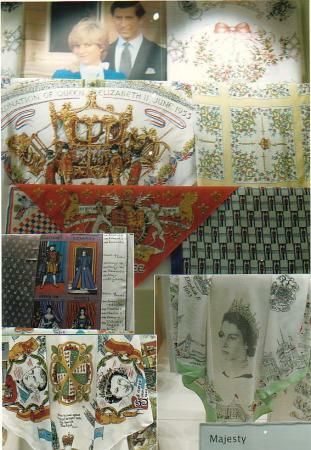 Below are some of the exhibits in the exhibition with Brenda's comments. 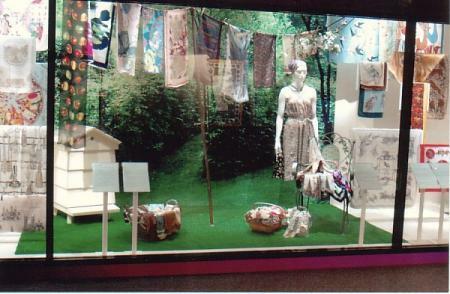 The exhibition was on until September 28th 2008 at the Snibston Discovery Park, Ashby Road, Coalville, Leicestershire LE67 3LN. Snibston Discovery Park was closed in 2015. In 1967 Brenda sold a design to Jacqmar for them to use as a headsquare. 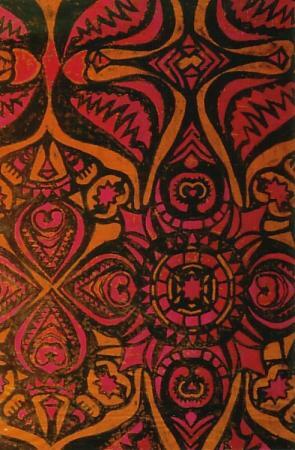 The picture shown is a different colourway of the same design. It was based on a drawing of hollyhock seeds and Brenda still has the receipt for its purchase. Brenda knows that it went into production as she saw it being worn but does not have one in her collection. 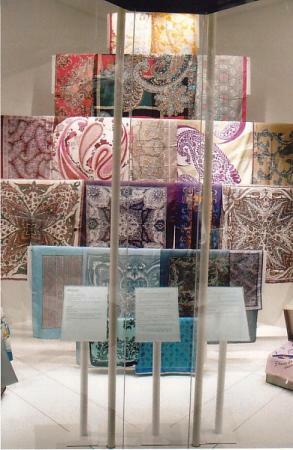 Do you have this scarf design tucked away in your wardrobe? Brenda would be delighted to find her lost headsquare. Photographs reproduced with the permission of Leicestershire County Council and Margaret Ingall. XHTML 1.0 validated. WCAG compliant. Page generated in 0.2116 seconds.